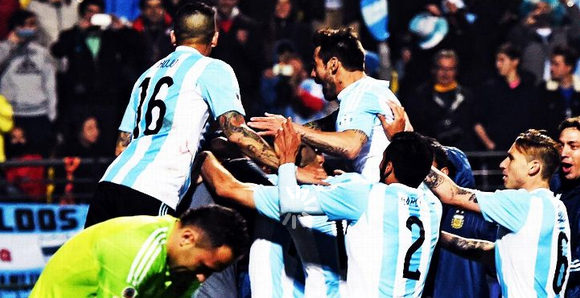 A penalty shootout sends Argentina to the semis of Copa America at the expense of Colombia. 14 penalties in the shootout, with some very poor efforts in it before Carlos Tevez sealed it for Argentina. Great game for Arsenal’s Ospina under the sticks for Colombia .It took 95 minutes, 16 shots and 14 penalty kicks after ill-tempered draw but Argentina finally saw off the resilient challenge of Colombia to reach the last four of the Copa America 2015.Argentina may be into the final four, but plenty of improvement is needed from Martino's men if they are to go all the way and lift the trophy. They will face either Paraguay or Brazil in the semi-final.Tevez netted with Argentina's seventh penalty after Lucas Biglia and Marcos Rojo had both missed opportunities to claim victory from the spot in Friday's Vina del Mar quarter-final clash.